Bthardamz is a Dwarven ruin located west-northwest of Karthwasten. A door across a ramp above requires a key. The gate at the bottom leads to an overgrown doorway. Neither can be accessed without following the related quest. The route from the Shrine to Peryite is to travel west until you reach a path, then follow this north, then west and then finally south. The are two wide stairways leading up to winding corridors. As you climb the second of these you will encounter two of the afflicted, one melee and one archer. Once these have been dealt with, continue up and along the corridors. You emerge at the top of a pair of spinning blades trapped stairways leading down to the main entrance. The lever for the blades is at the bottom of the second flight of stairs. Also at the bottom of the stairs is a doorway blocked by spears the lever to release these is to the right of the door. Climbing the stairs to the south of the top of the trapped ramp, at the top, to the left of the first covered tower that has another curved walkway climbing further to an empty area full of rubble, and a bridge across to a locked door requiring a key to open. Neither area contains anything of interest upon arrival. 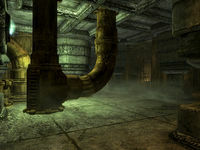 The locked door is the shortcut exit upon completing exploration of this site, with two unlocked Dwemer chests behind it. Once you have lowered the spears, there is a short, rubble-filled descent to a door. If you haven't started the relevant quest, the door will be overgrown with thick roots and you will be unable to proceed through, but once the quest is started these roots will disappear. Through this door is a room that has suffered quite a bit of damage, with piles of rubble around the room, large pots, and several stone benches lining the sides of the room, and two large pillars. 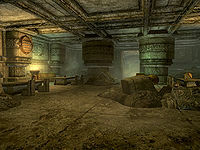 The only things of interest in this room are two unlocked Dwemer chests beside the left pillar. There is another door opposite the one you've entered which leads to Bthardamz Upper District. 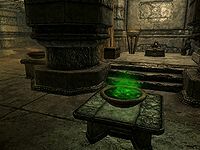 The first room has a chest on a table and a random damage health poison along with a pickaxe on another table, and 5 large pots containing glowing green stuff, one of which is tipped over. The door onward is to the west, opposite where you entered, and a ramp leads down. At the bottom, by 2 more pots overflowing with the glowing green stuff, the passage turns right (to the north), with a novice-locked gate ahead and an open door on your left leading to sleeping quarters. There is a stone table and chair beside this door. Through the open door, the sleeping quarters are a symmetrical room with two beds on your left and an opening in front of you, with a stone table, and a raised section with four more beds (one occupied by a sleeping afflicted). At the other end of the room there are two beds on your right (one occupied) and another opening leading to four more beds (one occupied) and a table holding a random poison. There is an unlocked door at this end of the room also, this brings you back out on the other side of the locked gate. The path continues to the north a short way before turning to the west. 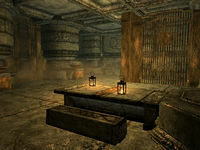 Almost immediately there is an open door on your right leading to a room with a caged area in one corner, the gate to this is adept-locked and contains a table holding a random poison and unlocked chest. 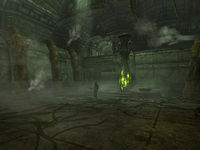 The corridor continues to the west past some rubble, then turns back to the north through a doorway, before descending into a room with three afflicted praying to Peryite around a stone basin full of glowing green vapor similar to the fumes you inhaled to commune with him. There is more damage around the room including a pillar that has toppled and is leaning against a wall in front of you as you enter. The afflicted will attack as soon as you are detected. The path continues in the northwestern corner, heading west and descending further. At the bottom of the ramp the corridor opens out into a cavernous room, the first part of which is uninteresting with a pillar in front of you and openings either side. Passing this you see that there are four afflicted roaming around the main part of the room. There are stairs leading up to a large central basin glowing green and bright green roots all around the room. To the southwest there is a tower with ramps leading up to the doorway blocked by spears. To the north there are two stairways up to a balcony level. In the middle of the balcony is a lever that lowers the spears blocking the path at the top of the tower opposite and to the right of the lever is an unlocked chest. To the right of the left ramp is a gold ore vein. At the top of the ramp you can now pass through onto a circular floor with the path heading east towards a closed door. Before reaching the door the path splits and doubles back on itself, descending several flights of stairs. 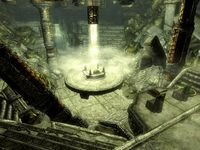 At the bottom, under the circular floor there is an unlocked Dwemer chest on the wall in front of you. Once looted backtrack to the closed door, which is unlocked. The sides of this room are very rocky and can be explored, but there is nothing of interest. Through the door, the corridor descends slightly to a T-junction. Ahead is a room, and the corridor continues to descend to the south. The room ahead contains many Dwarven scuttles on the walls around the room, with an unlocked chest on the east wall between the two scuttles that two Dwarven spheres emerge and attack from. 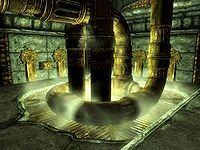 In the center of the room are large pipes that you can jump over to recuperate during the fight, if required, where they can't reach you, only fire Dwarven bolts at you. Back out of the room and continuing down to the south be careful of the pressure plate that will activate spinning blades on this ramp, and potentially two afflicted if they haven't already fallen fowl of this trap, as they can activate these blades with the lever at the bottom left pillar. At the bottom there is an open gate (which may appear closed). The path curves to the right and there are three afflicted roaming. On the left is a raised section with segmented sections and stone benches around tables. On the first of these is a random damage magicka poison. The lower section ends with a short flight of stairs up to an unlocked door leading to Bthardamz Workshop. Upon entering you are faced with a short corridor with Dwemer piping in front of you. An unlocked gate on your right leads to a bedroom area with a double stone bed, but nothing of interest. If you are sneaking and wait before attacking an afflicted you see wandering, you can witness a scene in which the melee fighter wakes up the mage, bringing orders from Orchendor. A note lies on the desk in the mage's room. Opposite the mage's room is another unlocked gate to another empty bedroom. Finally past the mage's room there is an open door heading south. 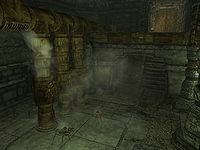 This leads you into a room with three vertical pipes in the middle, a door to the southeast, a long flight of stairs to the east, and in the northeast corner you can see a Dwemer chest next to a lit lantern and scuttle. When you approach a leveled Dwarven spider will emerge and attack. When you pass the vertical pipes three more spiders will drop and attack. Too much noise here will attract two afflicted from the next room through the open door to the southeast. Leave exploring this room for now and take the other stairs. At the top of the long flight of stairs, the door leads back into Bthardamz Upper District, but to a higher level. It is a balcony above where you first entered the workshop and gives you a good vantage point from which to snipe at up to four afflicted in the next area. There is a leveled damage stamina poison and an unlocked chest on the balcony. Go back down the stairs and take the open door to the southeast. This room contains the two afflicted unless you've already dealt with them. There is also an unlocked chest on your left as you enter this room. You pass an open doorway and keep going through into the next room. There is a door in the opposite corner leading back into Bthardamz Upper District. Upon entering this section, if you haven't previously dealt with the afflicted there will be four of them to take care of. In front of you to your left is a basin with a green growth in the middle with a glowing tuber half way up it. The path forward is to the right. There are two flights of stairs up from here, the right-hand set is shorter and leads up to a door to Bthardamz Dwelling. 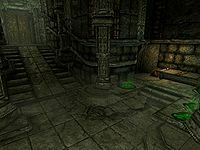 Before taking these, there is an unlocked Dwemer chest at the end of a short passage to the left of both flights of stairs heading north, and a gold ore vein along a ledge to the right of the top of those stairs. 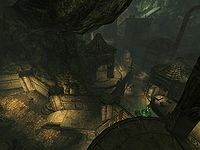 Up a third flight, some ramps, and a corridor is a door to Bthardamz Lower District which bypasses Bthardamz Dwelling. Through this door you enter a room that is quite well lit making sneaking harder. There is a stone table and chairs in front of you and off to the left is an apprentice-locked gate. Sneaking further into the room you will overhear a sister talking to her sleeping brother, who are both from the Reach, she is obviously unhappy here and blames Orchendor for their situation and thinks that his promises are lies, as she does not feel Peryite's favor and sees no way out of their situation. They are found to the left of the door, following it around to the left again, back on yourself. She is sat next to him, while he sleeps. Next to the bed is an unlocked chest. Through the locked gate is a table holding a copy of the Speech skill book Biography of the Wolf Queen. To the right of this is an unlocked Dwemer chest. Exit this area through the door you entered through. Upon exiting (back into Bthardamz Upper District) climb the long flight of stairs and then a second flight up. 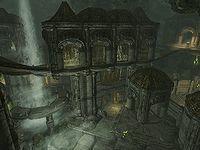 At the top, if you didn't before, turn left and left again out onto a balcony, where you'll find an unlocked Dwemer chest on your right slightly below you. Back to the top of the stairs, this time turn right, and right again before the next flight of stairs. Follow this to the end and around the corner to find a gold ore vein. 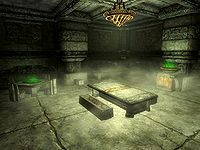 After mining keep going right past the vein and jump out onto the roof and explore this for another unlocked Dwemer chest. Backtrack to the stairs and now follow the path all the way to the top, climbing the ramps and following the passage until you reach a door to Bthardamz Lower District. Upon entering there is a short corridor with piles of rubble along its length, the passage turns to the north and enters a room. Around the corner to the left is an unlocked gate leading to an unlocked chest. The corridor continues to the north passing four scuttles, from the third and fourth of these drop leveled Dwarven spiders. The corridor turns to the east and ends at a door. This leads to an arena-styled room with a sunken illuminated round platform in its center, on which lies a chest, and tiered seats around it. There are three afflicted stationed here - one on the platform in the center and two sat in the spectator's area. The afflicted on the platform can be disposed of by using the lever in front of you to activate four stationary spinning blades. There is nothing else of interest in this room. The path forward is opposite where you entered. Through the doors at the end the corridor continues to the east, then turns to the north descending to an open door into another room. This room is empty, so continue straight through and into the corridor beyond. This ends at a bridge over a stream. There are plants with glowing green buds on them that when hit with an arrow will disappear and leave that place on the plant dark. There are two afflicted roaming this area. Attacking these can alert up to three more from further back in the room to investigate. Crossing the bridge and following the path through an open gate to an open area with two scuttles on the right-hand wall. From these two leveled Dwarven spheres will emerge and attack. Continue across the open area and just before passing through a opening, there is a pressure plate in the middle of the path that activates a slicer trap from above the opening and to your right you will see an unlocked wooden chest near another scuttle. Past the opening you may see a couple of afflicted roaming unless you dealt with these before. There is also a lever on the right that also activates the slicer trap. Here the path splits with stairs leading up in front of you and a brightly lit path off to your right. 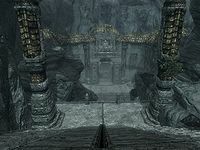 Climbing the stairs, at the top you pass under a covered section, immediately on exiting the other side, if you turn right against the side wall of the structure you'll find a skeleton beside an unlocked Dwemer chest. Ahead is a circular path around a waterfall, where an afflicted is stationed unless previously dealt with. Back down at the bottom of the stairs, where the path split turning right leads to a gold ore vein on the left. 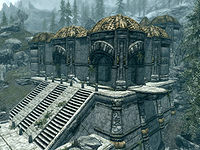 Beside that are more stairs ascending to an open area containing a couple of Dwarven scuttles on the walls, which it is possible to sneak past, however any noise will cause two leveled Dwarven spiders to emerge and attack. Past these is a door leading to Bthardamz Study. You enter into a room with a closed gate in front of you and a door off to your right. Opening the gate leads you to a room with an unlocked, wooden chest on the right. There is nothing else of interest in the room. Through the door on your right is a corridor that turns to the east and the bottom of a ramp, where a pressure plate can be found. It triggers a spinning blade trap on the ramp. At the top there is a scuttle that a Dwarven sphere will emerge from and a closed gate on your left. Through this is another corridor, with a table opposite. To the left of the table is an unlocked Dwemer chest. The corridor heads to the west and up to a door which leads back to Bthardamz Lower District. Through the door is a balcony above the previous areas. Around to the right is a ramp down. Looking from the top of the ramp to the right you can jump onto the roof here. In the last alcove along the side of the building that you've just emerged from is an unlocked chest. Descending the ramp the path splits left and right. To the right there is a gate, through which is another unlocked chest. When heading left along the path, be careful as there are four afflicted patrolling together. Once they are dealt with continue along the corridor until it opens out and there is a ramp up on your right. At the top you will find three more afflicted - two sit at tables with puddles of the green ichor in front of them and the third wandering back and forth behind them. Between the two tables is an unlocked chest on the wall. From the bottom of the ramp, follow the path along, through another covered area and up another short ramp, there are three gates in front of you, both the left and middle gates are open and the right gate is unlocked. All three gates leads to the same place, so just continue along the central path. The path eventually turns east and ends in a door leading to Bthardamz Arcanex. Follow the path onward, but be aware there are two Dwarven spheres and three Dwarven spiders guarding this area. Follow the path up the ramp after taking care of them. At the top of the long ramp there are stairs leading down on your left. Following these brings you to another unlocked chest. Back at the top climb the wide stairs in front of you. As soon as you reach the top a Dwarven centurion will appear at the far end of a short passage filled with empty scuttles along both sides. Depending on your archery skill you may be able to destroy it before it reaches you. Once it has been dealt with, look on the balcony on the left to find a quicksilver ore vein. 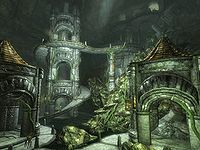 At the far end of the passage is an about turn to the left, with two scuttles containing leveled Dwarven spiders and a flight of stairs leading up. At the top are more scuttles and after turning to the west, on your right are two Dwarven mounted crossbows. Two Dwarven spiders will emerge from scuttles on the left and around the corner three more will ambush you. Keep following the path until you eventually find Orchendor. Once you kill and loot his corpse you will recover a copy of the Alteration skill book Reality & Other Falsehoods and a key to Bthardamz elevator enabling you to open a door found on the upper level, in the northwest corner that is locked and cannot be picked. Behind this is a lift that will take you up to the surface and another locked door that requires the same key. Before activating the lift there is an unlocked chest on the opposite side of the lift. After you kill Orchendor, his body may disappear or become glitched and unresponsive make it impossible to retrieve the key for the elevator. To fix this, simply go back to the door you used to enter Bthardamz Arcanex, enter Bthardamz Lower District, and re-enter Arcanex. You should find his body lying where you killed him. At the overgrown door it is possible to pull the lever to open the gate and run inside without having started the quest. Once this is done, there is no chain release and you can get trapped. The only way out is to fast travel. ? Orchendor is not tagged as a boss, preventing the location from being marked as cleared. This page was last modified on 10 December 2018, at 04:26.